I saw this today, and it reminds me I've been looking for ideas on how to sleep an additional child on the front seats. It doesn't quite look like the shape would work for the front seat of my Ford van, but maybe ... or I could rig something similar. Nice idea. Amazon.com has them for $70. I wonder how people buy those things then realize they are more than 4-feet tall? 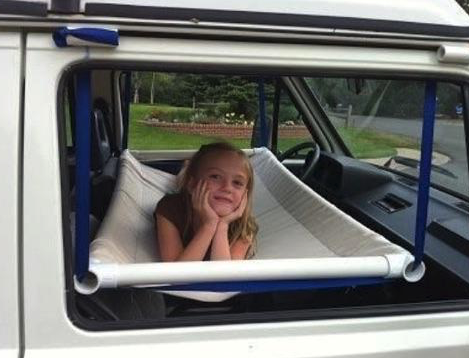 ive seen a few cool bed setups that people have done on here in their rigs for a front seat bed for the kiddos. i tired doing a search for one of the setups, but nothing is coming up. hopefully one of them will see this thread and can direct you to some pix. Just my opinion, of course, but I think all inflatable beds/mattresses/whatever are uncomfortable. For much cheaper than that could you rig up something like this? Seems like it would break down and store really small too. A few pieces of PVC, 2 straps and a sheet rolled up. Our old Westy had a bed like that. My daughter loved it when she was small enough to fit. The front seat sling thing might be better if suspended across the doors, resting at the top of the interior trim panels. Depending on the weight of the occupants PVC tubing might not be rigid enough at that length when used in this manner. Would have to be careful to build something that wouldn't damage or break the door glass. Our 72 VW camper had that front seat setup as well. It had aluminum poles on the long side that slipped into "U" shaped hangers permanently mounted on the A and, I think, B pillars. Our daughter liked sleeping or hanging out there as well.